There are so many items to consider when planning a bridal shower – there is the theme, the decor, the food and so much more! One area that many people question is bridal shower etiquette like who to invite, when to send out the invitation, to include registry details in the invite or not and more. Here I’ll answer some commonly asked questions to help you through the planning process. Before selecting a date, be sure to check with the bride as well as the bride’s and the groom’s parents. You want to try to choose a date that works for all of the people that will be there. You won’t likely be able to select a date that works for all of the guests but you don’t want to choose a date that doesn’t work for someone as important as the mother of the bride. Be sure to ask the bride what she wants in her bridal shower. This is a special day for her – one that she is sure to have dreamed of for years – so if there are special touches she wants to have in the shower you’ll want to make note of these. You don’t want to put too much pressure on her to think of ideas – just make sure that you don’t leave out something that is important to her. I once planned a party for a friend and I planned everything myself and thought I was doing her a favor by saving her from making decisions. I only realized after that I had left out some people that she wanted to be there. Will men also be invited to the shower? Let the bride decide if she wants a co-ed shower. Most bridal showers are more of a tea & dainty party than a loud music event with drinking. Save the loud partying for the bachelorette event and leave the bridal shower as more of a tame party – one that your grandma would be proud of! Listing the bride’s registry on an invitation can be left up to the bride. Some people see it as rude and others welcome the suggestions. You could always wait until guests ask you for a recommendation before you give the registry information. Something you definitely do not want to do is be too upfront on the invitation and say that the bride appreciates cash gifts or wants new shoes. I actually received that on an invitation once – true story! Do not send out the bridal shower invitations before the wedding invitations go out. Wedding invitations usually go out at least 2 months in advance which still gives you plenty of time to send out the bridal shower invitations. Send out invitations at least 4 weeks in advance so people have time to prepare and plan for it. Do not send invitations to people who have not been invited to the wedding. It can be seen as rude to get an invitation to the bridal shower but not actually be invited to the wedding. Send invitations to out of town guests even if they likely won’t be able to make it. It’s still nice to let them know that they are part of the celebration even if they can’t be there in person. You could even invite some people to pop in and surprise the bride-to-be on Skype during the bridal shower. If you’re like me, you may like to work alone on the party to create your vision of what you think the bride will enjoy. You may have other family and friends that want to help in some way so be sure to accept the help because you may hurt feelings if you don’t. For example, you may already have decor planned but you could suggest that the helper bring along a small dessert or help with refreshments at the party. Can you suggest that guests bring something to the shower (like a potluck dish)? You could – but I’d wait until the guest asked if there was anything they could bring rather than asking all guests to contribute. For some guests, they may not be able to afford to bring a potluck dish on top of a shower gift, wedding gift, outfit for the wedding, travel to the wedding, etc. Weddings are a very expensive time! Set a timed plan but don’t get stressed out if you run late. Be sure to give the bride enough time to visit with guests but don’t let time go by too quickly that the bride misses something she’s excited about like opening gifts or watching a slideshow. Be respectful of guests’ schedules because not everyone will be able to stay late if the party runs past the scheduled end time. As far as gifts go, it really is the thought that counts. I think people typically spend an average of $40 on a gift for a bridal shower but if you can’t afford that don’t worry about it! Just being there to celebrate with the bride is enough of a gift! Greet all of the guests, take their jacket and let them know where to find food and refreshments. Make them feel welcome. Introduce guests to each other so no one feels left out or isolated from the rest of the group. Assign someone to make notes of all of the gifts received and who they are from. This will help the bride later when she’s writing thank you notes. Walk each guest out and thank them for coming. Provide favors to the guests to thank them for sharing in the special day. Write thank you notes for people who helped you put the shower together. Did an aunt make the floral arrangements? Did Grandma bake a batch of her famous cookies? Write them a personalized note to thank them for helping to make the day so special. 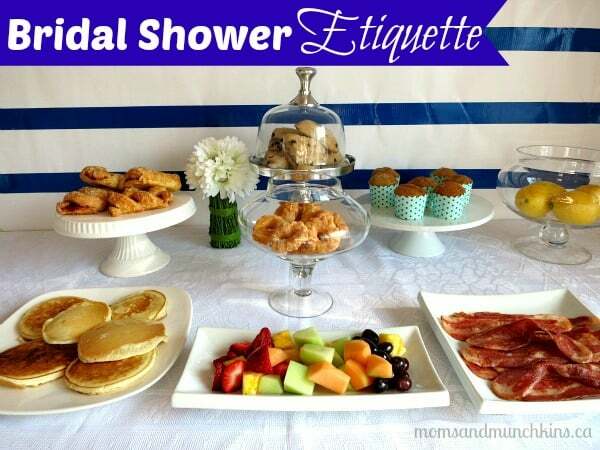 Do you have any additional questions about bridal shower etiquette? Let me know in the comments below and I’ll find you an answer! Stay tuned for a free printable Bridal Shower Checklist coming soon. If you are looking for more bridal shower ideas, visit our special Bridal Shower page. For sweet & exclusive bridal shower favors, visit Beau-coup (a Moms & Munchkins affiliate link). Thanks, Angie! Ya, I think I’m probably done with Bridal Showers for a while since most of my friends are married now. The etiquette thing is something that drives my bonkers sometimes – like no thank you notes after a shower or telling people “please buy me shoes”. Ha! I can laugh about it now but it was so awkward. 🙂 Thanks for stopping by!